I was seated in a comfy booth and I began to hear all about how this place came to be. Believe it or not, it’s been around for 9 months. They make all their pizza dough from scratch. They also make some of the cheeses in house. The pepperoni on the pizza is brought in from San Francisco and it’s really, really good. It doesn’t stop there, every salad dressing is made in house, and the lettuce is from local farms and the pasta is made in house as well. When you are in downtown Portland all this is a given, but when you are in the burbs, you don’t get this kind of treatment. Let me move on to what I got. I got the royal treatment, they let me try anything I wanted (this never happens) and I tried as much as I could. 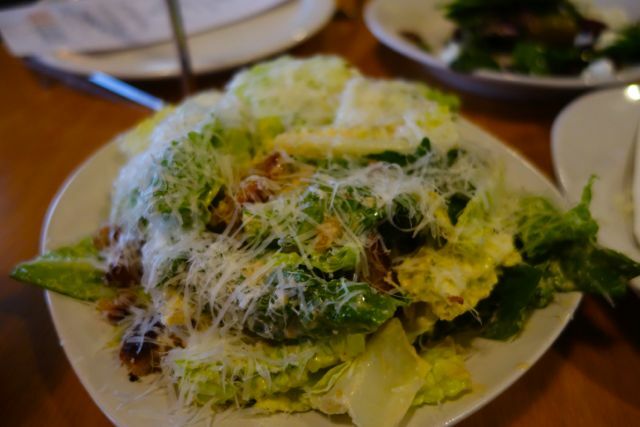 I had heard that their Brussels Sprout salad was super great, with house smoked bacon how can you go wrong? 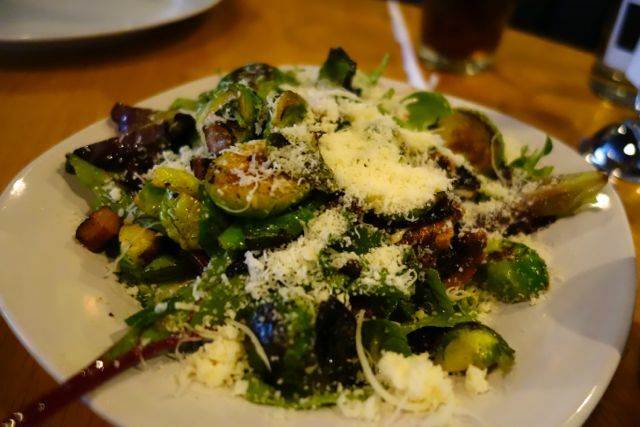 I love, love Brussels sprouts, so I was excited about this salad. It was served with lettuce, so much different than I expected and tossed with a great dressing. YUM! There was another favorite that was on the menu and that was a beet salad. 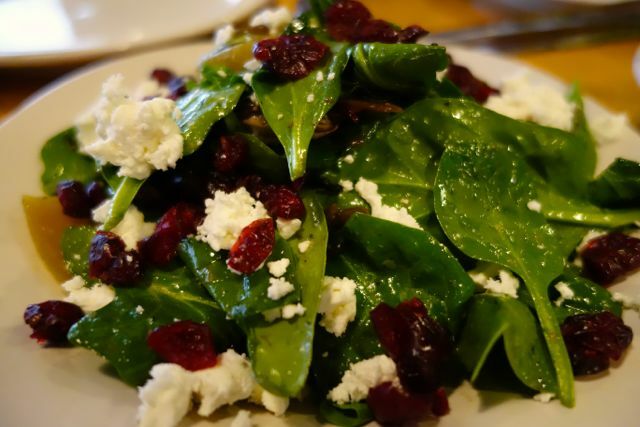 This salad was also tossed with lettuce, feta cheese, dried cranberries and walnuts. I honestly couldn’t decide which one I liked better, I am just glad I was able to sample both. Finally they brought out a Caesar Salad with a house made croutons. Another great salad for sure. Even though I enjoyed this, I went back for more of the others. Then the pizza arrives. 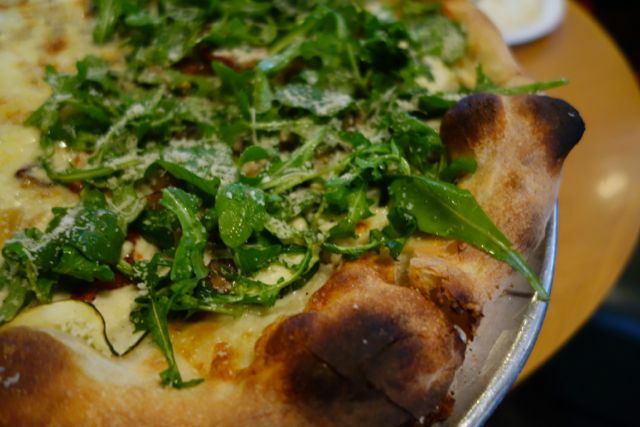 I had decided on a white sauce pizza and the first one I tried was the Sellwood, with roasted zucchini, red pepper, mushrooms, caramelized onion then topped with fresh arugula. This was my favorite of the day. There was so much flavor coming out of this with the sweet onions and savory mushrooms and peppers. I had leftover of this and I hid it from my family. 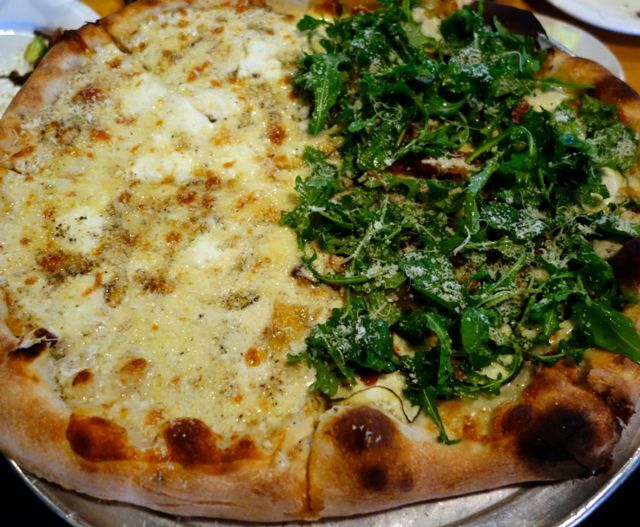 The other pizza we tried was the Willamette, with fresh garlic, oregano, mozzarella, parmesan, provolone, fontina, and black pepper. It was amazing how much the black pepper stood out on this pizza. Great execution of this pizza. 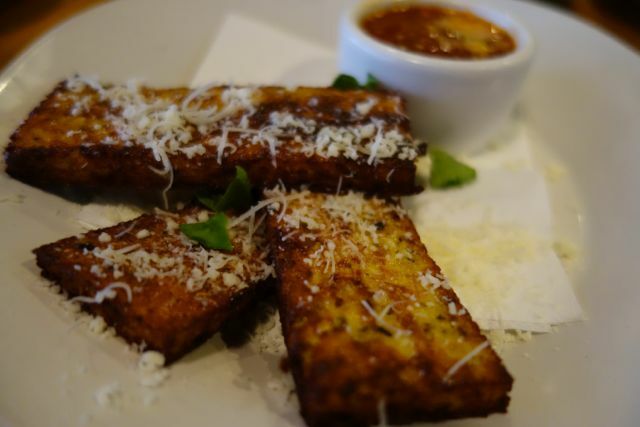 Before I left they insisted that I try the cauliflower bread sticks from the kids menu. Not only is this a great gluten free option, but this is also a great healthy option and it was fantastic. Loved them. Speaking of kids menu, they have worked hard to make a farm to table fresh kids menu. It’s fresh and it has great healthy options and those options are fantastic. There is even a kids play area for the kids so you can take your time and enjoy your meal. Don’t have time to stop for pizza or pasta? Stop by anyway and pick up some par baked pizza that you can finish at home or some fresh made pasta with sauce that you can also take home. In a hurry during lunch? 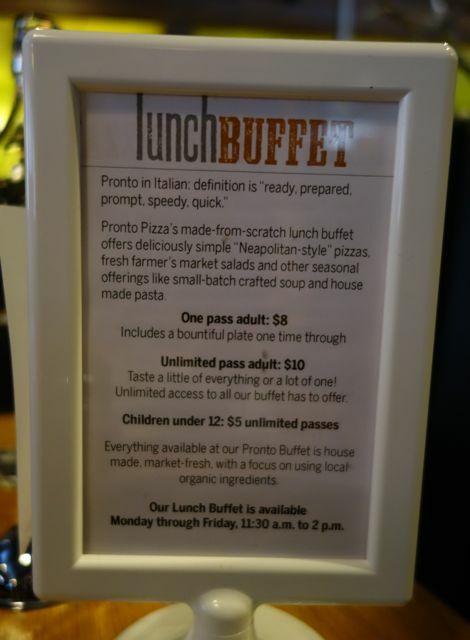 Then you might like this pizza buffet for just $8. I am going to stop talking and just suggest that you try this place out. If you live in SE Portland you are in for a treat. So go ahead, drive to 82nd Ave, to the strip mall and just walk inside. I would never promote a place I wouldn’t take my whole family. I already have plans for them to grab a par baked pizza on the way home from the mountain. Atmosphere is very much a strip mall restaurant. But don’t let that scare you away. Pricing is about $21 for a large pizza. The kids menu is super affordable at $3-$6. By the way, $6 gets you 3 choices. They have wine, beer and house made lemonades and specialty tea drinks. 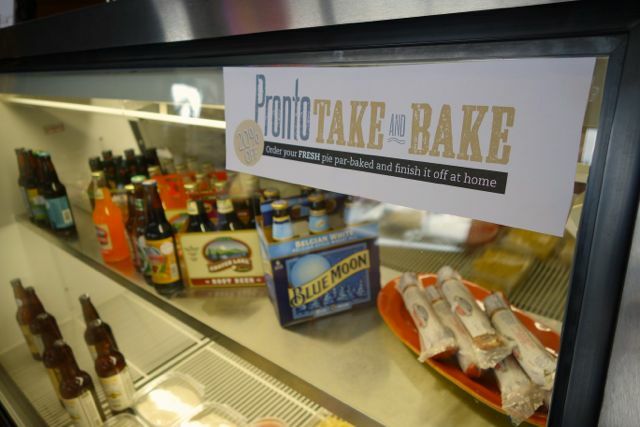 Pronto Pizza is located in Clackamas. Yes it’s true Pronto Pizza paid for my food. But all the opinions shared are my own and I know for a fact if you go to, you will agree with me. I’m glad you did a review on this place. We’ve considered this place a few times but like you, the strip mall-y part was a turn off. I will definitely give it a try now! Please report back when you do. And don’t skip the salads. The salads are great!